Bathroom, laundry and kitchen sink. If your sink or its drainage piping is leaking, we can repair the leak before it causes damage to your home. Sink Installation/replacement – We can supply and install all types of sinks to suit your needs. Kitchen, bathroom or laundry room sinks. We can remove your old worn out sink and install a new sink to match your style and budget. Bathroom or kitchen sink draining slow or completely blocked can not only disrupt your daily routine, if not addressed cause costly damage. We can get those drains running freely again and get your life back to normal. There are a number of reasons your sink can clog. Kitchen sinks are prone to accumulating food and grease and overtime can build up around the walls of the pipes. Bathroom Sinks are prone to collecting hair and soap which first appear as slow running and if left untreated result in pooling bathtubs, showers and bathroom sinks. Whatever causes your sink problem, you need it fixed and you need it fixed right. When this happens to you, take immediate action. Contact the professionals at Advanced Plumbing Drains & Heating when you are in need of sink repair in Toronto. Advanced Plumbing is Toronto’s faucet replacement and repair professionals. We are familiar with all major brands of faucets and have the expertise and experience to fix or replace your faucet the same day. Leaky kitchen or bathroom faucet is not only annoying but can hike up your water bill considerably. Often times a repair can stop the leak and prevent further damage to the fixture. Water leaking from faucet onto or below countertop. Slow or no running water from spout. Loud or abnormal noise during operation. Most often all of the above symptoms can be solved with a same day repair. Advanced Plumbing will arrive to your home with a fully stocked truck, ready to service most makes and models. 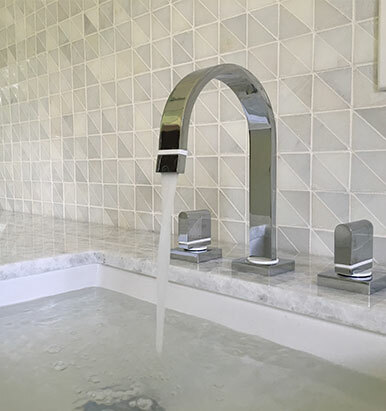 If your faucet requires special parts, we have developed excellent relations in the plumbing industry to help source parts for hard to find faucets. Perhaps your faucet is due for a replacement and it is time to update the look of your kitchen, bathroom or laundry room. We can help you breath new life into your bathroom with a new faucet. A new faucet is a simple way to change the look of your home while making routine lasts like washing dishes easier and more efficient. 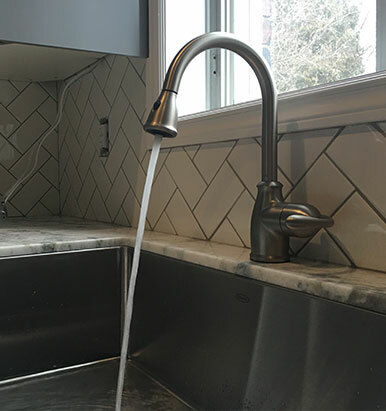 We arrive to your home with hand picked faucets that are sure to function as well as they look, but we can also work with our customers to find the perfect faucet for their budget and taste. For some design inspiration look at some of our installation pictures to see some of our work. 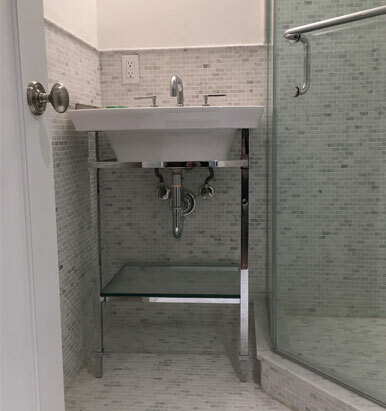 American Standard Vanity with matching widespread faucet in new bathroom renovation. 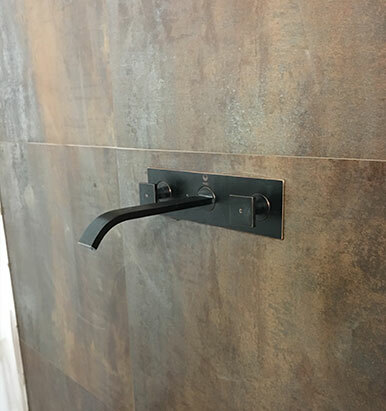 Wall mounted faucet in rustic oil brushed bronze finish. 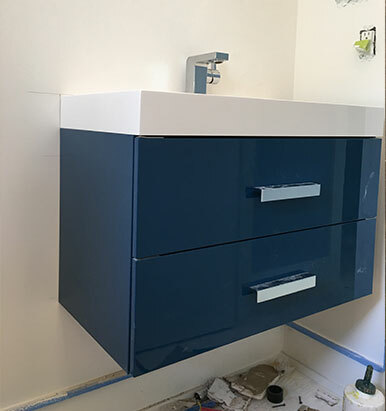 Electric Blue Decotec Vanity with single lever faucet in chrome. 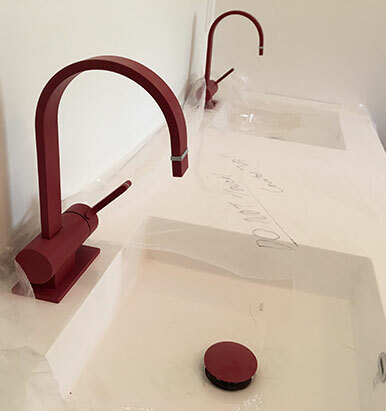 Stunning Riobel red powdercoated kids bathroom faucets. 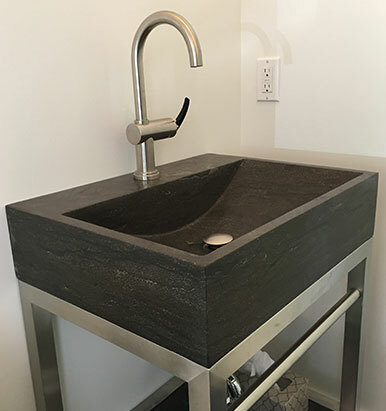 Solid stone vanity with steel base. Rubinet single lever faucet in brushed Steel. His and Hers Rubinet bathroom sink in chrome.